Wartime Economic Development | "Welcome Buddies"
The 1910s brought the start of Sarasota’s growth boom. Key figures, such as Owen Burns, invested in the city, hoping to turn it from a farming and fishing town into a key winter destination for northerners. It was this growth that allowed Sarasota, previously part of Manatee County, to split off in 1921 and form Sarasota County. Owen Burns, along with other businessmen, championed this decision as a chance for Sarasota to continue growing.1 Though the United States’ involvement in a global war redirected some attention to the war effort, development in Sarasota didn’t slow down until the Great Depression. Fig. 1 Advertisement in Sarasota-Times, May 4, 1916. The following sections illustrate how Sarasota’s boosters enhanced the city with hotels, golf courses, and railroads. The section on “Agriculture” details how, amidst this growth, Sarasota still heavily relied on its citrus crops. Some details from this section, as well as many others throughout the website, were provided in a filmed conversation with Harriet Burns Stieff, daughter of Owen Burns. Watch the clip below for Harriet’s introduction of herself and her father. Please note that the growth detailed in the following sections had a large impact on Sarasota’s citizens of color, pushing the African-American community, Overtown, north. Unfortunately, most relevant sources on this development begin in the 1920s, which extends beyond the scope of this website. For further information on Overtown, now known as Newtown, click here. Fig. 1. 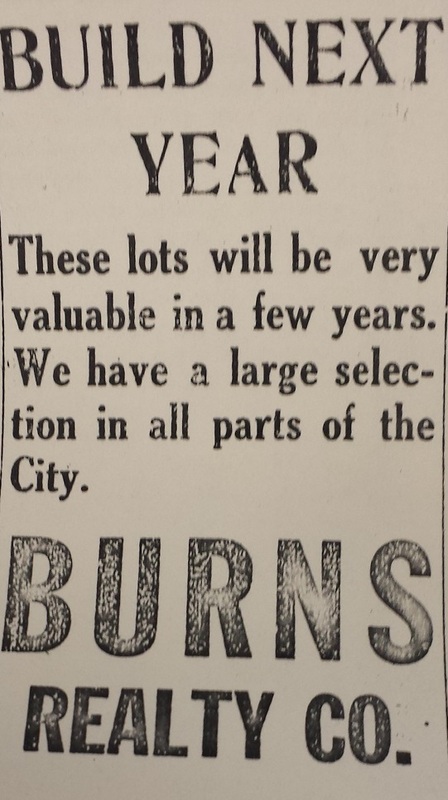 “Build Next Year,” Sarasota-Times, May 4, 1916, courtesy of Sarasota County Historical Resources, Sarasota, Florida. Jeff LaHurd, “1921: Birth of Sarasota County was contentious,” Sarasota Herald-Tribune, April 15, 2014, www.heraldtribune.com/article/20140415/ARTICLE/140419781?p=1&tc=pg (accessed March 17, 2015). “Sarasota Is Fortunate,” Sarasota-Times, October 15, 1914.